I intend to write these posts every week, on Fridays. Today is Saturday. It’s been 2 weeks. My point is, I’m still doing it. Are you giving up on a good thing because it fell off the radar? Lots of “to-dos” and shiny objects out there. Don’t lose focus on what you enjoy doing. 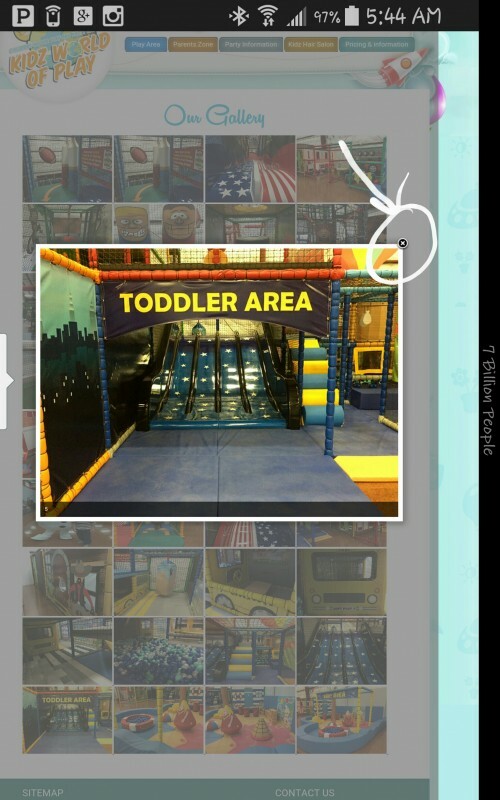 and we were looking up a local indoor play area to take our twin boys on their first birthday. 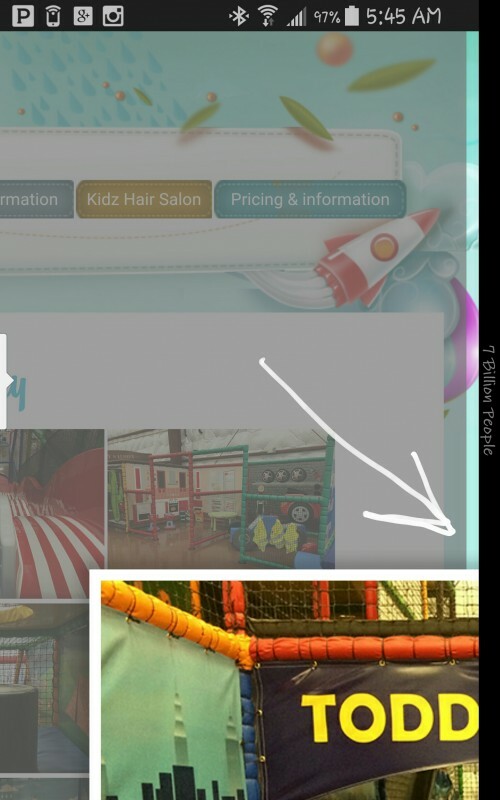 We seen some mentions of a place called Kids World of Play, LLC. Sounds interesting, so I pull up the website on my Galaxy Note Edge which has a 5.6″ screen. When I got to the gallery, I handed the phone to her to get a look. After flipping through a few pics, I watched her fight with the popup image, trying to close it. In her defense, that was a tiny “X”. And when she tried the “pinch and zoom” technique, it just flew off the screen, avoiding her at all attempts. That is what you call NOT mobile-friendly. Imagine people who are still using iPhone 4s type phones (only 2 years old) with a tiny 3.5″ screen (I pity them). Is your website driving people nuts? Not a good look my friend. Not at all. Google doesn’t like to give you a referral either, because they’re embarrassed. Starting April 21st, they’re going to rank your mobile-friendly competitors higher than you. In fact, they’ve been putting emphasis on this since November with their announcement of placing a mobile-friendly indicator in mobile search results. Audit Action: Perform a mobile-friendly test on your website here. If you failed. Don’t fret. If you’re on WordPress, I can fix this for as little as $500. Let me know and I’ll take a look. If you’re not familiar with Seth Godin, just know reading his books and blog posts will give you a PhD in marketing. I try to keep up. 2 weeks ago he posted The first rule of web design: Tell me where to click. If people have come to your website, that says A LOT. Lots of good things. There’s lots of options to click places before they clicked on your website. What is the ONE THING you really want them to do when they get there? Call? Request a quote through a form? Learn your processes before proceeding? Whatever it is, don’t put equal emphasis on all of the things your website has to offer. Make ONE BIG SHINY “CLICK HERE” button (in aesthetic, mobile-friendly fashion of course). I like reviews. I like getting them, reading them, leaving them. I don’t like when I can’t do either of those 3 things for a particular business. There’s truth in it’s difficult to get reviews, but that doesn’t mean it’s impossible. The first step is optimizing profiles on all the sites that matter, so that it’s easy to get reviews: Google, Facebook, Yelp (yes, Yelp), Houzz, YellowPages.com, etc. Then there’s tools to route people to leaving reviews. This can be coupled with a strategy such as post cards that direct to a review page on your site. The real benefit however is displaying those reviews. All of the websites mentioned above have their own ways of accomplishing this. Usually it’s referred to as a Badge or Widget. You can also markup some testimonials that you received offline or via email and utilize those to target specific neighborhoods in search results. Audit Action: Take a look at your website. Any reviews/testimonials displayed? According to a Nielsen study Finding Opportunity Online with the Mass Affluent, the workforce mass affluent are 19% more likely to research product purchase for their homes. The retired mass affluent are 32% more likely to use local search. The latest edition of Hanley Wood’s Residential Remodeling Index (RRI) indicates we’ve climbed to 97.2% of the remodeling activity peak of 2007. Pretty solid stats to motivate having reviews on a mobile-friendly website that has a clear call to action.